The interpretation center also embraces a space dedicated to Ramón J. Sender (his childhood and part of his youth were spent in Alcolea). 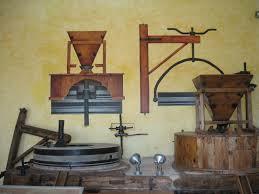 The center is located in a flour mill established in the 13th century, but at the present time has machinery and parts from the mid-twentieth century. This center has various rooms dedicated to grinding and to the archaeological deposits of La Codera, both with informational panels. Another multipurpose room is used as an exhibition room or fully equipped conference center. The Ramón J. Sender space consists of two rooms, one dedicated to computer consultation and the other one to read Ramón J. Sender’s works.